2004-2007 Mississippi State University. Analytical Chemistry. 1987-1991 M.S., Physical Chemistry, Cairo University, Giza, Egypt. 1984-1987 B.S., Chemistry, Cairo University, Giza, Egypt. E. M. Hassan, H. Abou-yousef, P. H. Steele, and E. M. El-Giar “Characterization of Fast Pyrolysis Oils from White Oak and Sweet Gum Woods”. Energy Sources, Part A: Recovery, Utilization, and Environmental Effects, 2016, 38, 43-50. E. M. Hassan, Emad M. El-Giar, and P. H. Steele “Evaluation of the antioxidant activities of different bio-oils and their phenolic distilled fractions for wood preservation”, the International Biodeterioration & Biodegradation, 2016, 110, 121-128. Ashraf F. Ali, Mohammad L. Hassan, Azza A. Ward, and Emad M. El-Giar “Processing, Microstructure, Thermo-mechanical, and Dielectric Properties of Barium Titanate/Cellulosic Polymer Nanocomposites”, Polymer Composites (first published online on June 22, 2015). Anthonia E. Eseyin, El Barbary Hassan,, and Emad M. El-Giar, “Comparative Analyses of Nigerian and US Corn Stalks Using Py-GC/MS”, International Journal of Advanced Chemistry, 2015, 3, 18-24. Anthonia E. Eseyin, Kieran I. Ekpenyong, S. M. Dangoggo, Onyanobi Abel-Anyebe, and Emad M. El-Giar, “Product Distribution in the Low Temperature Conventional Pyrolysis of Nigerian Corn Stalks” International Journal for Innovation Education and Research, 2015, 3, 51-68. Anthonia E. Eseyin, Kieran I. Ekpenyong, S. M. Dangoggo, Emad M. El-Giar, and Onyanobi Abel-Anyebe “The Effect of Pd-Doped -Al2O3 on the Low-Temperature Thermal Decomposition of Corn Cobs and Leaves in Bio-oil Production” The International Journal of Science & Technoledge, 2015, 3, 11-17. Anthonia E. Eseyin and Emad M. El-Giar “Low-Temperature Catalytic Pyrolysis of Corn Stalks. A Novel Route to the Production of Bio-Oil and Valuable Chemical Feedstock” The International Journal of Science & Technology, 2015, 4, 132-142. E. M. El-Giar, M. Asle Zaeem, H. El Kadiri, R. S. Florea, H. Rhee, Y. Bienvenu, M. Dahmen, T. Malot, and M. Cherkaoui “On Laser Welding of Thin Steel Sheets.” Science and Technology of Welding and Joining, 2012, 17, 571-580. H. Baraka, M. Khanfar, J. Williams, E. M. El-Giar, G. Shah, and K. El Sayed “Bioactive Natural, Biocatalytic, and Semisynthetic Tobacco Cembranoids”, Planta Medica, 2011, 77, 467-476. E. M. El-Giar and D. O. Wipf “Microparticle-Based Iridium Oxide Ultramicroelectrodes for pH Sensing and Imaging”, Journal of Electroanalytical Chemistry, 2007, 609, 147-154. E. M. El-Giar and D. O. Wipf “Preparation of Tip-Protected Poly(oxyphenylene)-Coated Carbon-Fiber Ultramicroelectrodes”, Electroanalysis 2006, 18, 2281-2289. E. M. El-Giar, R. A. Said, G. E. Bridges, and D. J. Thomson “Localized Electrochemical Deposition of Copper Microstructures”, Journal of the Electrochemical Society 2000, 147, 586-591. Ashraf F. Ali, Sahar M. Atwa, and Emad M. El-Giar “Development of Magnetic Nanoparticles for Fluoride and Organic Matter Removal from Drinking Water” book chapter IN: Nanotechnology in the Agri-Food Industry, Editor: Alexandru Grumezescu, Academic Press, Elsevier, Volume 9: Water Purification, Chapter 6, 209-262, Jan 15, 2017. 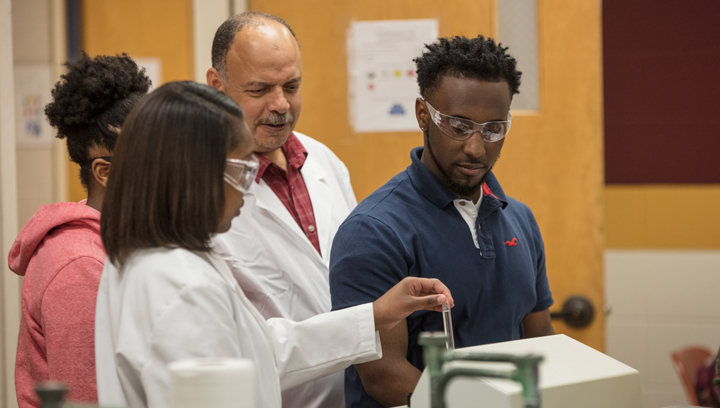 Emad El-Giar, Emanuel Waddell, Marquita Jacobs, and Gloria Thomas-Magee, “Fabrication of Bioanalytical Microfluidic Devices”. In “Biological Applications of Microfluidics”; F. A. Gomez, Ed. ; Wiley & Sons, Inc.: NY, 2008; Chapter 18, pp 357-371. G. Thomas, E. M. El-Giar, L. E. Locascio, and M. J. Tarlov “Hydrogel-Immobilized Antibodies for Microfluidic Immunoassay (Hydrogel Immunoassays)”. In Methods in Molecular Biology, Vol. 321 (Microfluidic Techniques: Reviews and Protocols); S. D. Minteer, Ed. ; Humana Press: Totowa, NJ, 2006; pp 83-95. E. M. El-Giar and D. J. Thomson “Localized Electrochemical Plating of Interconnectors for Microelectronics.” Proceedings of the IEEE Conference on Communications, Power and Computing, WESCANEX 97, 1997, 327-332. W. A. Badawy and E. M. El-Giar “Preparation, Electrochemical, Photoelectrochemical and Solid State Characteristics of Indium-Incorporated Titanium Dioxide Thin Films for Solar Energy Applications.” Proceedings of SPIE-The International Society for Optical Engineering 1991, 1536, 277-288. E. El-Giar “The application of the electrochemical methods in corrosion protection of engineering alloys in the automotive industry and determination of the active ingredients in drugs” The Academic Innovation Council, the 2nd in the Faculty Collaborative Initiative Presentations, ULM, Nov 17, 2017. L. Lee, M. Kim, K. Tran, and R. Skains, E. El-Giar “The use of cyclic voltammetry to determine and compare the concentration of acetaminophen in different fever-relief drugs”, ULM Student Research Symposium, April 2017. S. Helforoosh, T. Hayes, and E. El-Giar, “Cu and Ag electroplating using screen-printed electrodes”. ULM Student Research Symposium, April 2017. 1. The production and characterization of bio-oil through the catalytic pyrolysis of agricultural feedstock. 2. Use of electroanalytical techniques (e.g., cyclic voltammetry, linear sweep voltammetry) for the electrodeposition of metals and the characterization of electroactive (redox) species in drugs. 3. Study of the electrochemical behavior of bare and paint-coated metals and engineering alloys in aqueous corrosive solutions using electrochemical impedance spectroscopy (EIS) along with other chemical and electrochemical techniques. 4. Preparation and characterization of ultramicroelectrodes (UMEs) for scanning electrochemical microscopy (SECM) and other electroanalytical applications. El-Giar, E. M., Atwa, S. M. (2017). Development of Magnetic Nanoparticles for Fluoride and Organic Matter Removal from Drinking Water (pp. 209-262). Alexandru Grumezescu, Academic Press, Elsevier,. El-Giar, E. M. (2015). Processing, Microstructure, Thermo-mechanical, and Dielectric Properties of Barium Titanate/Cellulosic Polymer Nanocomposites. Polymer Composites. El-Giar, E. M. (2016). Evaluation of the antioxidant activities of different bio-oils and their phenolic distilled fractions for wood preservation (pp. 121-128). International Biodeterioration & Biodegradation. El-Giar, E. M. (2016). Characterization of Fast Pyrolysis Oils from White Oak and Sweet Gum Woods (pp. 43-50). Energy Sources, Part A: Recovery, Utilization, and Environmental Effects. El-Giar, E. (2015). Low-Temperature Catalytic Pyrolysis of Corn Stalks. A Novel Route to the Production of Bio-Oil and Valuable Chemical Feedstock. International Journal of Science & Technology. El-Giar, E. (2015). The Effect of Pd-Doped -Al2O3 on the Low-Temperature Thermal Decomposition of Corn Cobs and Leaves in Bio-oil Production (pp. 11-17). The International Journal of Science & Technoledge. El-Giar, E. (2015). Product Distribution in the Low Temperature Conventional Pyrolysis of Nigerian Corn Stalks” (pp. 51-68). International Journal for Innovation Education and Research. El Giar, E. (2012). On Laser Welding of Thin Steel Sheets (pp. 571-580). Science and Technology of Welding and Joining. El Giar, E. (2013). Characterization of Fast Pyrolysis Oils from White Oak and Sweet Gum Woods. Energy Sources, Part A: Recovery, Utilization, and Environmental Effects. El Giar, E. (Principal), "The Use of Poly(oxyphenylene) Coatings to Improve the Contact Galvanic Corrosion between Magnesium Alloys and Steel Fasteners in Automotive Vehicle Systems" (Completed But Not Yet Submitted), Sponsored By The Automotive Metals Division (AMD) of the United States Automotive Materials Partnership LLC (USAMP), External to The University of Louisiana at Monroe, $150000. (July 01 2010 - Present). Meyer, S. (Principal), El-Giar, E. (Co-Principal), "Ultra-high performance liquid chromatography capability to enhance research and training among ULM toxicology, chemistry and pharmacology" (Pending Funding Decision), Sponsored By LA BoR, External to The University of Louisiana at Monroe, $91644.00. (July 1 2017 - June 30 2018). El-Giar, E. M. (Principal), "Preparation of polymer film coatings for corrosion protection of steel alloys for applications in the automotive industry" (Funded), Sponsored By ULM, The University of Louisiana at Monroe, $2,000. (May 01 2015 - December 31 2016). El Giar, E., "The application of electropolymerized-polyphenol coatings for corrosion protection of steel alloys" (Funded), Sponsored By LA EPSCoR Pilot Funding, External to The University of Louisiana at Monroe, $10000. (January 03 2013 - December 31 2013). El Giar, E., "Electropolymerized Polyphenols Coatings for Corrosion Protection of Steel Alloys" (Pending Funding Decision), Sponsored By LA EPSCoR Pfund FY 2011-12, External to The University of Louisiana at Monroe, $10000. (February 2012 - January 2013). El Giar, E. (Principal), "The Use of Poly(oxyphenylene) Coatings to Eliminate the Contact Galvanic Corrosion between Magnesium Alloys and Steel Fasteners in Automotive Vehicle Systems" (Funded), Sponsored By LA EPSCoR-LINKS WITH INDUSTRY, RESEARCH CENTERS, AND NATIONAL LABS (LINK), External to The University of Louisiana at Monroe, $3500. (July 03 2010 - August 06 2010). January 2017 ULM’s Foundation Award for Excellence in Teaching . April 2015 Tom and Mayme Scott Endowed Professorship in Teaching Excellence Award, ULM (April 2015). August 2014 The ULM foundation Award for Excellence in Teaching . April 2014 College of Arts and Science Award for Excellence in Teaching, College of Arts, Education, and Sciences at ULM. January 2013 College of Arts and Sciencesâ Award for Excellence in Teaching. December 2012 Tom and Mayme Scott Endowed Professorship in Teaching Excellence Award. January 2012 College of Arts and Sciencesâ Award for Excellence in Teaching. 2004 T.A. of the Year(Nominated). 1988 Faculty of Science Award. 1987 Top Graduate and Outstanding Senior B.S..